Many podcasts use music to spice up their recordings. This is fine when a track is properly licensed, or if it is podsafe, but using substantial portions of tracks without permission can become problematic. This is what iBus Media, the company behind PokerNews – the self-proclaimed “largest poker website in the world” – just discovered. Last Friday the company was sued for willful copyright infringement in a California federal court. The complaint was filed by a group of record labels and music publishers including UMG Recordings, Capitol Records, Universal Music, and PolyGram. They accuse PokerNews of distributing podcasts through its site and app, using significant portions of their tracks. 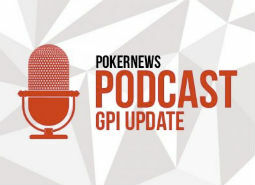 “Among the content made available by iBus Media on PokerNews, and through other forums, are hundreds of podcasts that intentionally incorporate significant portions of Plaintiffs’ copyrighted musical works,” the complaint reads. This shouldn’t really come as a surprise, according to the music companies, who explain that PokerNews’ parent company was already notified of the issue several years ago. 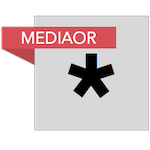 “iBus Media was notified that it was infringing Plaintiffs’ copyrighted works nearly three years ago. Nevertheless, iBus Media continues to infringe. iBus Media’s infringement is therefore willful and deliberate,” they write. 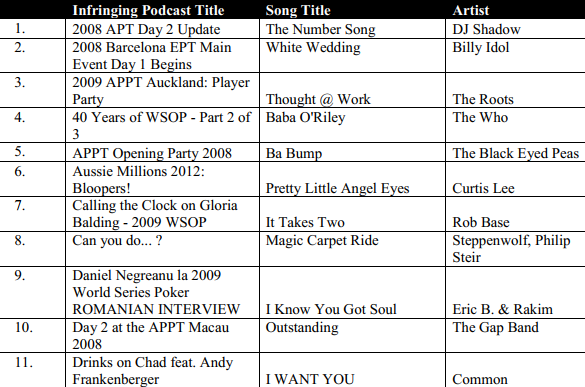 The complaint lists hundreds of podcasts where infringing tracks allegedly appear. This has resulted in “substantial” and “irreparable harm,” the labels say, adding that PokerNews profits from this unauthorized use. “In each of the Infringing Podcasts, Plaintiffs’ copyrighted works are prominently featured and undoubtedly used with the intention of making the podcasts more appealing to listeners,” the complaint reads. PokerNews said it has taken steps to remove certain infringing content, but according to the music companies, the problem persists. They, therefore, demand $150,000 in statutory damages per infringed work. With 46 copyrighted songs listed in the complaint, the maximum statutory damages go well beyond $6 million, but it’s possible that even more titles could be added when the case proceeds. In addition, the music companies also request a preliminary and permanent injunction preventing PokerNews and any other iBus Media properties from infringing its copyrights going forward. A copy of the complaint, obtained by TorrentFreak, is available here (pdf).